The U of S Student Chapter of the American Association of Pharmaceutical Scientists (AAPS) was launched in January 2015 and is the newest AAPS student chapter, joining 96 other student chapters in 19 countries around the world. We are a non-profit student association that connects students and postdoctoral fellows from various disciplines to the AAPS – one of the largest professional scientific societies with 12,000 members worldwide. 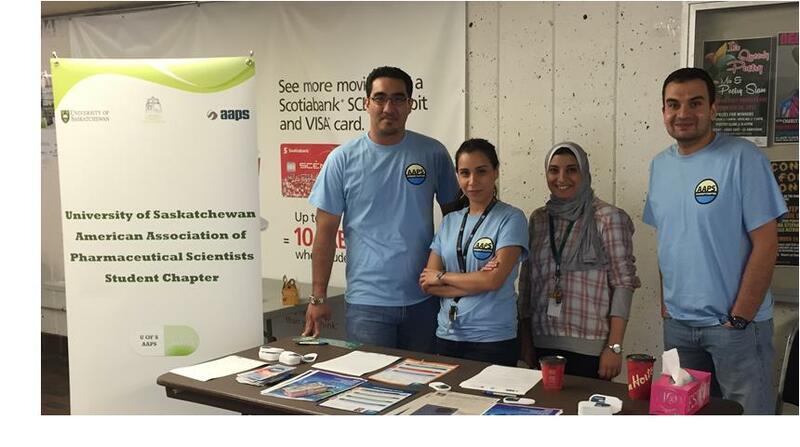 Our AAPS student chapter is the first of its kind in Saskatchewan and fifth in Canada. Over the past year, the chapter has grown to 45 members. About 90% are graduate students. Our members are from various backgrounds such as pharmacy, nutrition, chemistry, biomedical engineering, and arts and sciences. The chapter helps student members share knowledge from varied disciplines, connect with peers, and develop communication and leadership skills. The chapter also organizes workshops, seminars, and discussion groups on career opportunities and current advancements in pharmaceutical sciences. On April 29 2015, we held our launching event at the GSA commons with around 30 attendees including students, postdoctoral fellows, and faculties from the college. Our faculty advisor, Dr. Kishor Wasan, spoke about the AAPS and its associated benefits. Over the last year, we organized several events to provide students opportunities for professional development, such as “road show” promotional events to recruit student members from across campus and the college's Research Day, resulting in 11 oral and over 50 poster presentations. Currently, we are working on bringing guest speakers from industry to talk to members about job opportunities and challenges in the pharmaceutical industry. Recently, we received a grant to sponsor a national conference and workshop to enhance our students’ knowledge of the latest advances and discoveries in the pharmaceutical sciences.